The city of Galveston, located just off the Texas Gulf coast on Galveston Island in the Galveston Bay, has long been one of America’s finest and most productive sport fishing destinations. Part of the upper coast of Texas, the bay meets with the Gulf of Mexico creating a unique blend of seawater and freshwater that hosts a great variety of fish species along with numerous types of fishing possible. This is made even better by the strong presence of the many Galveston fishing charters, which allows for much more fishing opportunities away from the coast. Visiting anglers looking to take advantage of the plentiful Galveston fishing opportunities should take note that there is a required fishing license by state law. Unlike many states that do not require anglers to carry their own license when fishing aboard charter boats, a Texas fishing license will be required here along with a saltwater stamp. However, the non-resident fisherman can buy as many of the special “one-day licenses” he/she wants at one of the many local bait & tackle shops, sporting goods stores or even online. Everyone has their own personal tastes when it comes to fishing and Galveston has pretty much every type of fishing opportunity possible thanks to its coastal location within Galveston Bay. A great way to test the waters so to speak is to hit up fishing piers or beach fronts for some fun. There are plenty of different ways to fish here, from banks and piers to surf fishing from the beach – pack your tackle box accordingly. Just about any Galveston fishing pier will likely be popular and could be busy, meaning shorter rods tend to be the best option here. Make sure your tackle is appropriate for the type of saltwater fish you’re targeting too, as some of the fish caught from piers can get pretty big. Surf fishing from the beach means you will need longer rods for your set up. If you aim for hitting the deeper waters past the sandbars, long lines are a must, as well as a surf casting or spinning rods that are long enough to get the job done (10 – 16 feet are usually recommended for this type of fishing). Various species can be found depending on what type of fishing you are doing, but the likes of flounder, speckled trout and sand trout can all be caught here. If you’ve never fished the area or just want a new experience, hiring one of the local Galveston fishing guides is a good bet. Going a few miles out will offer a completely different fishing experience, so it’s about the taste of each angler when in Galveston. Rod and reels can vary depending on how far you go out, although durable and stout equipment is a must when talking open waters. How far you went to head out really depends on what you want to catch. Galveston fishing trips close to the coast or within the Bay will offer many exciting species while further out, deep sea and “bluewater” fishing distances such as 60 to 100 miles offshore, will put you in touch with some true Galveston giants! Species found closer to the shore include Redfish, Black Drum, Sea Trout, Flounder, Sheepshead and even Black Tip Shark. 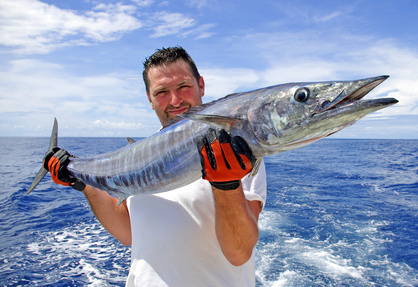 Going further offshore will put you in contact with Red Snapper, Amberjack, Sailfish and King Mackerel, not to mention Hammerhead and Tiger Sharks. Be ready for a battle with these larger species though, as they will really test your skill, strength and technique. Most Galveston fishing charters can take you to the best spots and offer the right tackle and bait for whatever you are aiming to catch, with even specialized tackle and bigger rods and reels readily available if need be. For budget outings, a Galveston party boat will provide all the excitement you want for a small fee. For true veterans and or anyone looking for more intense fishing, a Galveston deep sea fishing or overnight offshore fishing trip can be done as far out as 100 miles or more from the coast. So anyone looking to take on a monstrous Bluefin Tuna that can reach weights exceeding several hundred pounds should look for one of these excursions, with many of the Galveston fishing charters specializing in this type of deep sea angling. Expect to pack some of your heavier tackle for this should your hired boat not provide it, with heavy-duty rod and reel a must. Some of the other bigger game fish that can be caught out in these deeper waters include Marlin, Yellowfin Tuna, Wahoo, and Dorado (Mahi). Going overnight for these can be quite the experience, and is perfect for those who want to make a serious fishing trip out of their visit to Galveston.